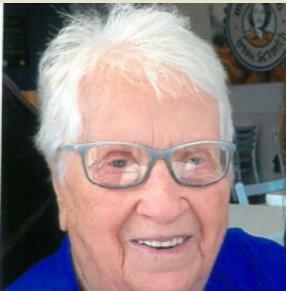 It is with great sadness that the families of Mary Alice Brown nee Hutchings announce her passing at the Corner Brook Long Term Care Facility, in Corner Brook, NL, on Monday, November 26th, 2018 at the age of 95 years. Leaving to mourn with fond and loving memories her children; Hughena (Fraser) Bennett, Margaret (Bradley) House, and Larry (Myrna) Brown, her grandchildren; Llewellyn (Heather), Faron (Janet), Scott (Annette), Calvin, Lorna (Anthony), Lisa (John), Paula (Less), Anne (Kenny), Tara, and Brad, her 13 great-grandchildren, 4 great-great-grandchildren, special recognition for her granddaughter Heather Bell who was by her side almost daily from July 2018, to November 26, 2018, her sisters; Jessie Caines, and Olive Mackenzie, her brothers; Stanley Hutchings (Bride), and Colin Hutchings (Linda), son-in-law; Stewart House, daughter-in-law; Mary, sisters-in-law; Belinda Hutchings, and Nora Brown, brother-in-law; Claude Brown, mother was predeceased by her husband; Frederick Brown, daughter; Bernice, and sons; Adrian, and Gary, granddaughter; Kimberly, grandsons; Clayton, and Stephen, her great-great-grandson; Baby T.J, and her mother and father; Blanche and Henry Hutchings. Also leaving to mourn a large circle of nieces, nephews, other relatives, extended families, and friends. The family will be receiving family and friends at Parsons Funeral Home & Chapel 63 North Main Street, Deer Lake, NL, on Tuesday, November 27th, 2018, from the hours of 2-4 & 7-9 pm. In keeping with Mary’s wishes cremation will take place and a Memorial service will take place on Friday, November 30th, 2018, at 2:00 pm, at St. Mary The Virgin Anglican Church in Cow Head, NL, with Rev. Canon Terry Rose officiating with the Inurnment to follow at the family plot of church cemetery, in Cow Head, NL. To sign the guest book or send a message of condolence please visit our web page at www.parsonsfuneralhome.com. The funeral arrangements have been entrusted to Parsons Funeral Home & Chapel 63 North Main Street, Deer Lake, NL.